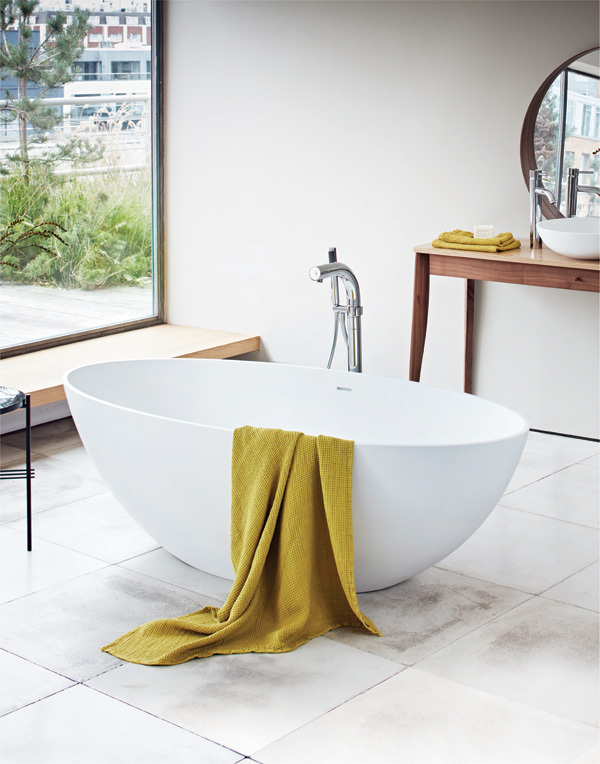 The trend for freestanding baths is very much in the here and now, affirms Philippa Turrell. Just Google the ‘World’s Best Luxury Bathrooms’ and the vast majority of hotel suites will feature a freestanding bath. 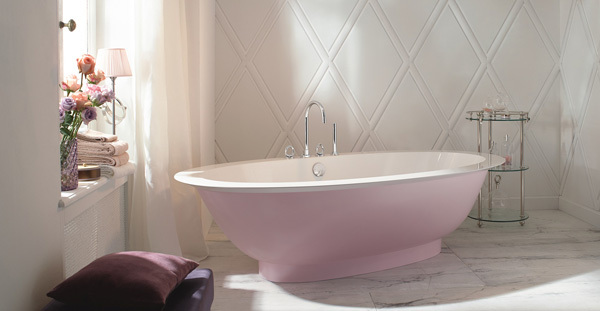 Forming part of the Bathrooms to Love Collection by PJH is the Edinburgh freestanding tub. 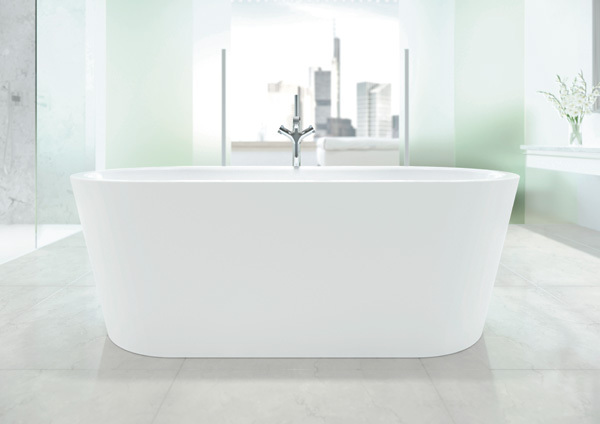 The skirted, double-ended bath measures 1700 x 750mm and comes with a 20-year guarantee. Whether it’s the Shangri-La in London, the Ritz Carlton in Hong Kong or the Southern Ocean Lodge on Kangaroo Island in Australia, the freestanding bath is present showing it is still a marque of bathing indulgence. It’s little surprise, then, the freestanding bath continues to be coveted for residential bathroom refurbishments. While the shower may be the go-to for everyday bathing convenience, the freestanding bath is about spending time luxuriating in water for well-being, not just purely for cleansing. Designed by Ludovica and Roberto Palomba is the self-titled Palomba, from Laufen. A modern slipper design, and made from solid surface, it measures 1800 x 900mm and comes with optional air massage and LED lighting. 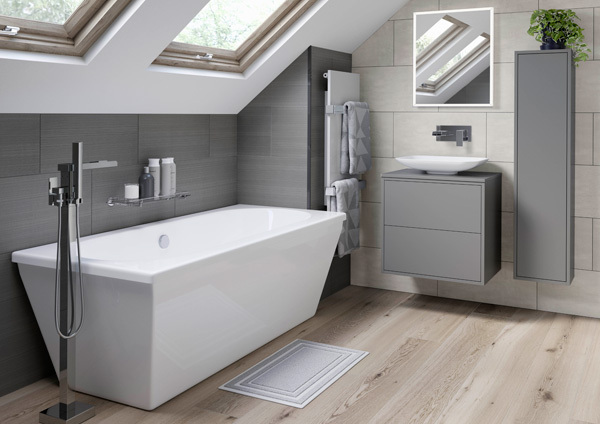 With ever more hectic lifestyles, spurring the need for relaxation, it could be why baths, together with sanitaryware, still account for the largest sector of the bathroom product market. Featuring a modern, sculpted form, Bella by Hudson Reed is made from Cian acrylic resin and offers a silk matt white finish. It measures 1495 x 720mm, has a push button waste and a base which allows for above the floor pipework. With the added cache of creating prestigious bathroom surroundings, it signifies why the freestanding tub is in high demand. 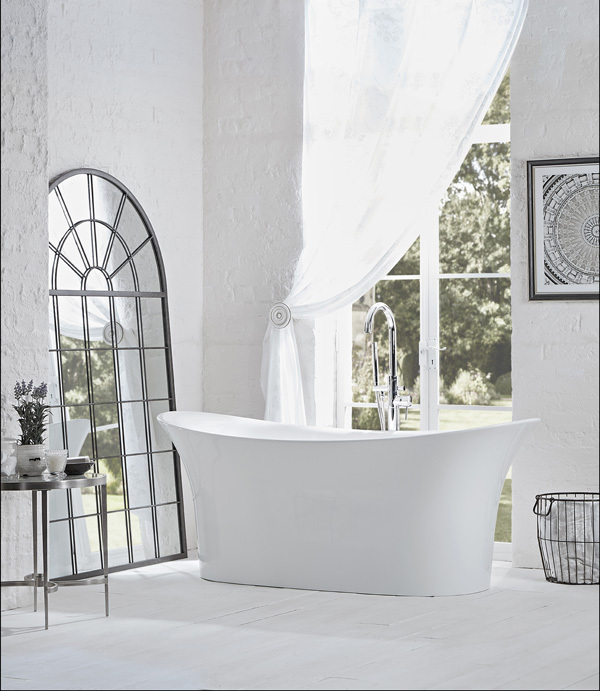 The contemporary stone Ellipse Bath from Waters Baths of Ashbourne features curves and narrow ends. It has been designed to provide support for back and shoulders. It is made from DQ Cast material, boasts a matt white finish, and measures 1760 x 540mm. 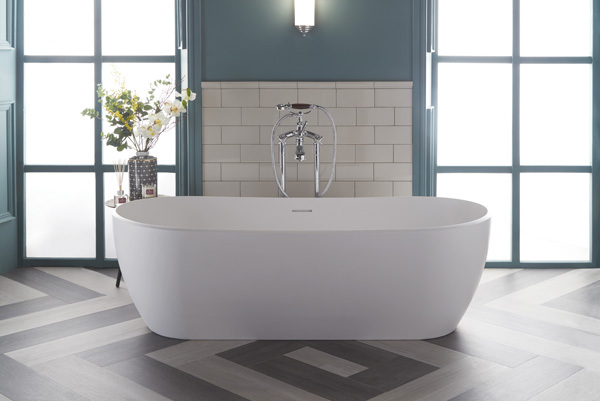 The market has also broadened for freestanding baths, as it’s no longer simply about the premium-priced slipper bath with ball and claw feet. Stone resin and acrylic have furthered widened the design options, as well as opening up sales avenues for those with more modest budgets with models from as little as £240. The Silence freestanding oval bath forms part of VitrA’s 4life range, created by German industrial design group NOA. It measures 1700 x 900mm and comes complete with an electronic pop-up waste. Available in nine skirt finishes, including three metallic options, is the Sensuelle freestanding bath from Utopia Bathrooms. It is shown here in one of the Roseberry colours, Peacock Blue. In fact, the diversity of models is why Sven Resinghoff of Bette exclaims the Silhouette range of baths is the company’s most popular models: “Bette has a large range of freestanding Silhouette baths, in different shapes, sizes and colour options, including some which are designed to be positioned in a corner or against a wall for use in smaller rooms. And this array of choice for designers is further aided with a shift towards colour. Last year, saw the start of the movement, but this year coloured baths seem to be in full effect. 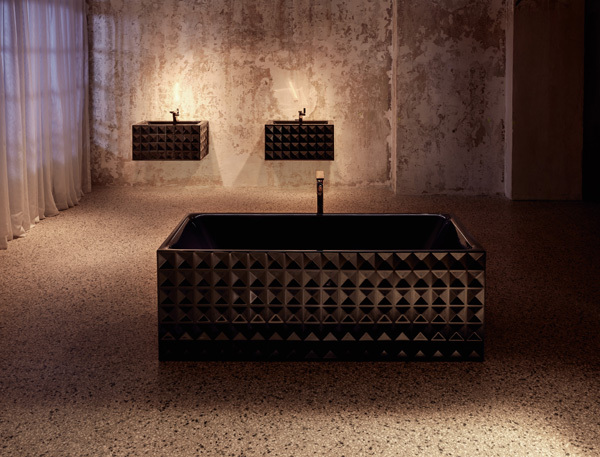 Now available in black, as well as white, is the BetteLoft Ornament bath which features geometric embossing. It boasts tight radii corners and slim edges for a generous bathing area in a footprint of 1810 x 810mm. However, it’s not a shift towards a singular colour but a vast array now available from bath manufacturers. The neutrality of white has been joined by the other end of the spectrum black, with Bette having recently introduced its Loft bath in a black finish and Rapsel showing its LaVasca bathtub in black at Salone del Mobile in Milan. Burgbad’s Crono is available in a choice of four formats – rectangular with sides, rectangular with put-down space at each end, oval with tap ledge and oval without tap ledge. The tap ledge model measures 1800 x 800mm and is available in white or painted finishes. Reflecting this trend, Bette has recently previewed three ‘effect’ colours at Salone del Mobile which are available in the Autumn. But for the discerning client seeking greater personalisation then designers are able to offer a tailored service, with paintable options. Hesketh is manufactured in Britain from solid surface material and is available in two sizes – 1700 x 750mm and 1800 x 800mm. It is supplied with Thomas Crapper branding. 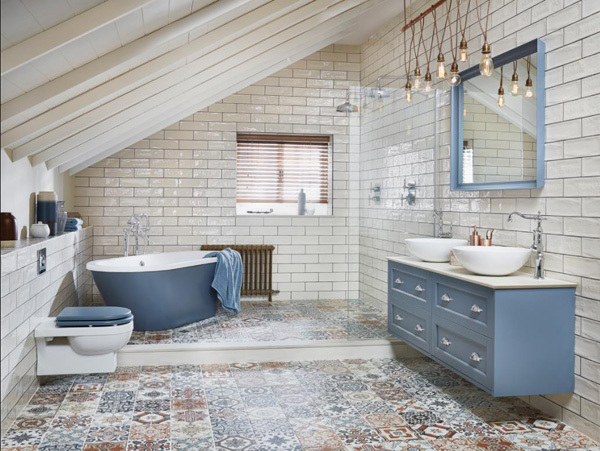 BC Designs recommends Farrow and Ball or Little Green Paints for its traditional Boat baths, but can also offer them in any RAL or British Standard colours and can also colour match the finish. Sven Resinghoff exclaims Bette is also able to offer a similar service for its freestanding baths, as he explains: “Better also offers architects and project planners the options of creating their own individual colour for their baths. In fact, freestanding bath design is constantly evolving from colour and texture, through to concealed plumbing for sleeker lines and even spa systems for the ultimate indulgence. 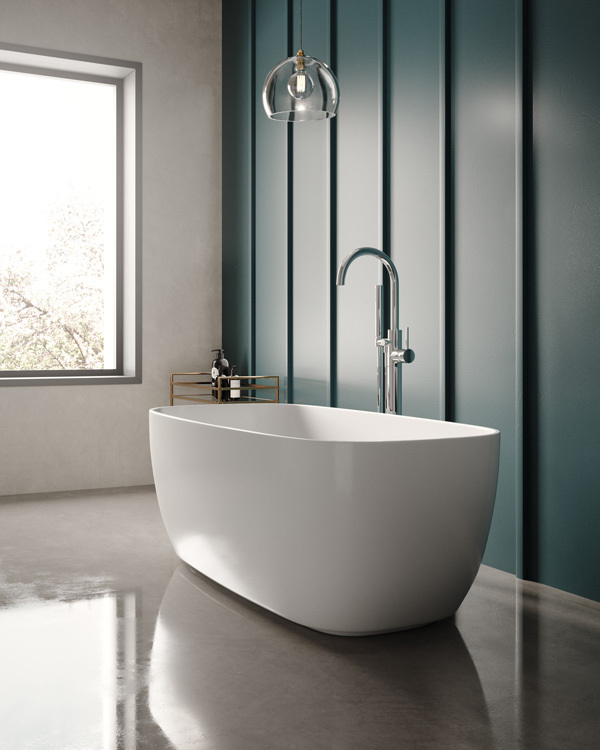 Made from mineral-cast material DuraSolid A, which offers precise edges, is Duravit’s Durasquare freestanding bath. It is available with overflow and Push Open waste, as well as optional air whirl system. Treese uses concealed ‘ghost’ whirlpool jets in its Dream freestanding tub, while managing director of Duravit UK Martin Carroll explains his company opts for an air spa system: “The Duravit Air-System perfectly complements the Cape Cod and Durasquare freestanding baths. 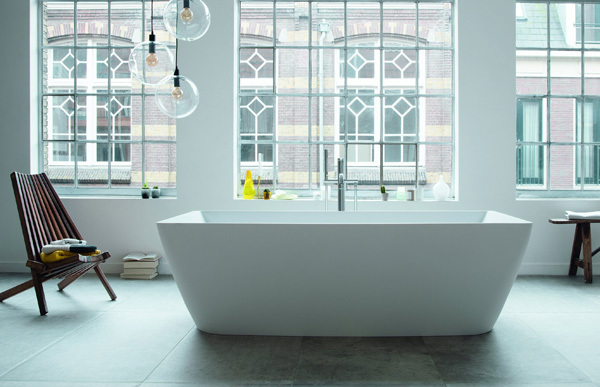 Continually evolving to meet the needs of discerning consumers, and as we reported last year, the trend for freestanding baths shows no signs of slowing. Laura Ashley Bathroom Collection has added Stretto, a contemporary take on a traditional bateau design. The double-ended model is made from twin-skinned acrylic and measures 1750 x 790mm. Industry experts concur; they not only create a statement, a centrepiece to the look of a bathroom project, but also provide comfort with well-being benefits in equal measure. As Margaret Talbot of VitrA summarises: “Combining the enduring consumer interest in all things healthy, with a range of designer baths that look and feel like a work or art, offers a huge potential for retailers. Kaldewei’s Meisterstueck Classic Duo Oval has been introduced at a more affordable entry price point. Made from enamelled steel, it comes in 1700 x 750mm and 1800 x 800mm models, and is available with optional anti-slip.